It happens sometimes. A friend or colleague is telling me a funny story or explaining an event that happened, and at some point I will ask “What did you say?” I got the beginning, but somewhere along the way I missed something and needed clarification of the last point. The speaker pauses, as if to think about the question, and replies “Never mind.” Usually, this is accompanied by a dismissive wave of the hand or shake of the head or both. I hate that, don’t you? Never mind is a dismissal. It is an insult. It says that the listener is not important enough to the speaker to repeat what was said. This also applies to “forget it,” “it’s not important,” and “don’t worry about it.” If I hear that from somebody enough times, I don’t bother to interact with them any longer. It’s not worth my time. I essentially say “never mind” to them — just not out loud! Maybe I am being too sensitive. Sometimes the story is probably not important enough to repeat or there is not time to go through it again now. Even so, it still bothers me and it probably bothers others with hearing loss too. More concerning is that this type of dismissal may lead to social withdrawal for people if it happens enough. “Why bother to interact with others if I am only to be scorned for not hearing everything perfectly,” some might think. It becomes easier not to try, then to face the dismissal and shame. Thus begins a downward spiral. So, how can we better handle this type of situation and nip bad feelings in the bud? I have two suggestions for the speaker, but more importantly, one very effective tool for the listener. If someone doesn’t hear you, rephrase the last thing you said. It really does not take that long. If someone tells you “Never mind,” you should calmly reply, “Please, I really would like to hear what you have to say. Do you mind trying once more?” It is hard to say no to that, plus your assertiveness makes it clear that you will not take dismissal as an appropriate response. Readers, how do you counteract the dismissal of “never mind”? ← What If You Could Construct Your Ideal Hearing Aid? Happy to have you share your own take. Thanks for reading! Specifically, one of my biggest frustrations is when someone (particularly a significant other) says something quietly within a conversation (especially within an argument) and then refuses to repeat it. In their mind, they said something they maybe shouldn’t have and then are glad that you missed it. But in my mind, if a person with normal hearing would have heard them, then they owe it to me to let me hear it too. It’s not fair to take advantage of my hearing loss as a way of changing the communication rules. Even after 6 years together, I think my significant other (SO) is still trying to learn what it’s like living with someone who’s hard of hearing. Being hard of hearing means communication has to change, it’s frustrating for me that my SO doesn’t understand this. He unknowingly takes advantage of my hearing loss. Obviously, he’ll (and other friends and family) never know what it’s like to being hard of hearing/deaf/Deaf. They don’t understand how hurtful “never mind” is. It’s might be helpful for them to think of it as both of you having the hearing loss. You both have to work together to make communication successful. It takes two. It is those people that are selfish when they say ‘never mind’. Those are tough situations to interrupt but you got too! If they don’t then avoid those people. But make sure your brave enough to be assertive and confident when you want them to repeat it! Practice a dialogue of ways of saying it that makes it sound right. My way for getting someone to repeat it is, “what was that?” Or “what’s that?” Or “say it one more time”. It sounds weird when you read it but sounds fine when you say it out loud. Thank you Heather. I am glad you like them. I often get “never mind” when someone wants to whisper something to me, and of course, I cannot hear whispers (I also can’t see lips if someone is putting them to my ear). But there is no point asking them to repeat themselves because they then tell me they can’t say it louder, because they don’t want others to hear. So I then say, text it on your phone and send it to me. Because I hate being left out!! Texting is a good idea! I agree that’s a great one! I have been living with hearing loss for a long time and with hearing aids for 18 years. My condition is proving to be progressive and I imagine this is true for anyone suffering from hearing loss. As everyone on this page knows, hearing aids are a blessing but not a cure-all. Noisy environments, people who do not articulate clearly (which is everyone born after 1950), groups larger than two and wind all work together to interfere with our understanding. Notice I did not say “hearing”. Understanding is the Holy Grail of hearing. If everyone among my family and friends sounded like Walter Cronkite, I would be “healed”. Well, it would be easier to understand what everyone was saying. Unfortunately, over the years I have begun to avoid situations in which I can not function satisfactorily as a listener. Withdrawal is not a healthy solution to anything, specially if you are a social person, but nothing is more tiring than having to ask for someone to repeat what they just said – and, as it has been said above, it doesn’t take long before you realize that including you in a conversation becomes more than others seem to want to do. 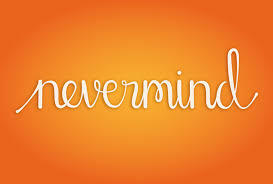 Never mind? I think not. It’s time to surround ourselves with people who “get” it and can make room for our disability. And that’s what it is. I don’t like one damned bit, but that’s what it is. My dad was basically deaf but in denial most of his life. I lost hearing in one ear at 25. So I am familiar with both sides, so to speak. It is important to separate the never minds that, I think, are the majority and would occur with non hearing impaired people from what, I think, is being said here. The dismissive sort. A lot of what humans say is actually, not needed! By the time you say it, you realize, Oh, it is done, not needed, or doable with out that person. Hence, never mind. Nothing to do with them getting the message. Indeed, if a person is deep in thought and did not register the request, never mind. There is a third type: Men. Men are visual beings. Women are verbal. A man may hear but, not vocalize a response. A man might not hear, and not vocalize a response. Thanks so much for sharing this awesome post. Would love to remain connected to a fellow blogger. My blog site is http://www.theaudiologisttobe.com. Please let me know if you’d be interested in guest blogging. I love your perspective! Also reposted and tweeted this at https://www.facebook.com/theaudiologisttobeblog THANK YOU! Thank you for reading and sharing. I am always happy to be connected with other hearing related bloggers. I will check out your site! I have hearing loss, and if someone said never mind to me, I’d say, “Oh, well excuse me, if you’re to busy to explain that, I’m too busy to talk to you.” Then I’d go away. Hmp. THIS is one of my biggest gripes! If you think it’s important enough to say it to me in the first place, PLEASE have the decency to repeat it when I don’t understand you! I usually hear the end, but not the beginning as I have to be concentrating on what you are saying to understand you completely. The end doesn’t make much sense without the beginning so I get confused. I ask you to repeat, and you only repeat the part I’ve already heard! Seriously pisses me off. And then I get yelled at “turn up your hearing aides” like that’s going to make me understand you better. I was a supervisor and sometimes my employees would mutter something in front of me. I’d ask them to repeat and they always said “never mind.” Then they’d go to another supervisor and complain that I wasn’t listening to them. I could go on and on. I try my best so don’t dismiss me! It won’t kill you to repeat yourself. And if there is just one word I still can’t grasp, spell it out! And in the meantime, stop covering your mouth when you speak. It can be very frustrating! We need to keep educating everyone how to help us hear better. Its been helpful reading the different feelings and experiences of dealing with hearing loss.. I’m just learning now and awaiting the arrival of my first hearing aides..its all little strange to me right now and I didn’t even know I had a problem til now..Im hoping others will be helpful as I go through this adjustment in my life…thanks for sharing such personal information and letting me know I’m not alone in this..
You are definitely not alone. Thanks for staying in touch.